Oh well. I'll keep trying. Here's one for diesel ambulance lovers. Don't know if it's a scam or not. FLAGGED - as we all aught to do when seeing a scam. This post sure checks the boxes for being one. It's pretty frustrating these scammers. Whenever I see a post I do 2 google searches to see if the listing comes up elsewhere: I search the images and I select a section of the text description for a search. I also click the reply button to respond to the ad to see if it lists a number with area code in the vicinity of where the vehicle is purported to be located. I'll even check the license plate if in the pic. That's all I got for scam sniffing so if others have tips I'll apply those filters before posting. In any event, if someone see's something near me of interest and they want a local look, I'm happy to check it out in person. Right on! I think everyone in here appreciates when others post rigs they have seen for sale scam or not, that way they can be flagged all the same. We're getting better at spotting scams, and scammers are getting better at camouflage. But there is just something in the way things don't add up that triggers my suspicion . If I'm not sure, I will also search around to see if it is legit or not. Thanks to all of you who are doing your part to keep it real! I plan on listing my van soon. I’m having a hard time determining what it’s worth, I thought this might be the place to get a few opinions. I’ve got a 97 E350 Chateau with a V10 and a partial U Joint conversion (no transfer case), 168k miles, 4.10 gears, fresh brakes, bedrug, double din stereo with BT and back up camera, BFG KO2 tires (33”), custom side steps and light bar w/ 3 hella lights, full size spare on custom mount inside, and much more. Currently set up with four captains chairs, but have the bench seat also. Interior is in fantastic condition. The 4x4 conversion could be completed or left as it is. It has been done for 6+ years with many trouble free miles. I bought the van out of Arizona and brought it to So Cal, so rust free. I know I can put a big price on it and come down, but I thought I’d get some opinions. Maybe another expo member looking for a van, this could be your chance. 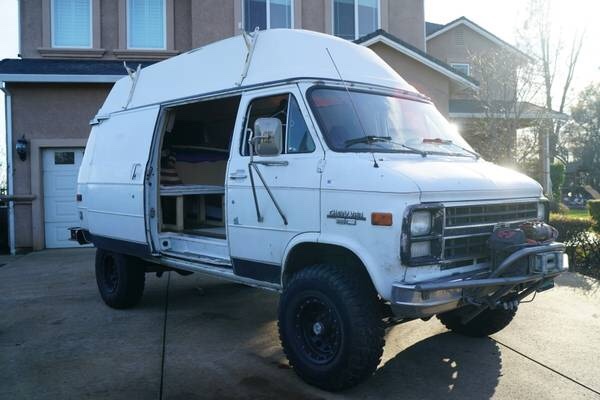 I think my search for a van is beginning (heavily debating a van conversion vs a cargo trailer conversion). I highly doubt this is in my price range though. Regardless, PM me when you come up with a number! I’m not sure if this is a deal but it’s hard to find in this area. IMHO he's a bit high. He posted up in a fb group asking what the value is, and took the highest # and ran with it. However, people are nuts for the PSDs so then again he just might get it. Here is a local one in my area. 4X4, would just need cabinets and internal infrastructure. Wow, that’s really nice. Plus it’s got a van passenger/co-pilot door and side entry for the back. Seems reasonable for under 100k miles and an ‘06. Guess the 6.0 scares people away a bit more than if it was a 7.3. I like my Chinook, but I’d take that limo bus any day.